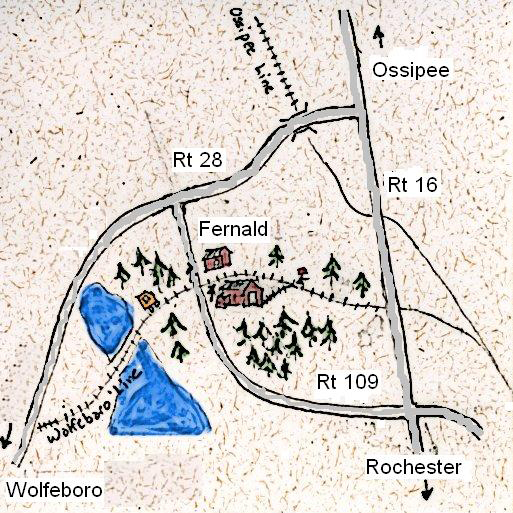 The Cotton Valley Rail Trail Club of Wolfeboro, NH would like to invite the public to our open house at Fernald Station, 64 Governor Wentworth Highway in Wolfeboro. The event is designed to give the public an opportunity to meet with members to discover more about CVRTC, railroad preservation and the railroad motorcar hobby. Visitors will be able to tour the restored former Wolfeboro Railroad engine house, train station, and working railroad maintenance of way equipment. Free rides will be provided in member owned railroad motorcars on a section of the former Wolfeboro Railroad. CVRTC, a non profit organization founded in 1992, currently maintains the 11 mile line, which is currently designated as a "rail with trail corridor" where railcar hobbyists, runners, bikers, and snowmobilers can equally enjoy access to the stunning scenery of the Lakes Region. The Cotton Valley Rail Trail Club, Inc. began in the summer of 1992 when a group of New England rail car owners joined with a group of local railroad enthusiasts in Wolfeboro, NH. Together they obtained permission from the State of New Hampshire to operate rail cars and to maintain the former Wolfeboro Railroad including structures. The refurbished former Fernald Station, is now used as the Club's meeting place. This collection of railway motor car enthusiasts and volunteers have joined together to preserve railroad property and equipment relating to the use of railway motorcars and have kept alive the skills and experiences of the railroad workers who once used these vehicles in maintaining railroad lines around the world. CVRTC currently maintains 17 miles of rail owned by the State of New Hampshire. The two rail-lines are the Wolfeboro-Sanbornville, NH branch line, no longer used by the railroad and known as the Cotton Valley Trail, and a portion of the Ossipee Branch between Rt. 28 and Rt.16. Light refreshments including drinks, water and hot dogs will be available. We usually have CVRTC apparel for sale throughout the event. CVRTC is a not-for-profit organization. Donations are graciously accepted. Take Rt 16 south to Ossipee. At the intersection of Rt. 16/Rt. 28 take Rt 28 South towards Wolfeboro. At the flashing yellow light intersection with Rt. 109 take a left, the CVRTC engine house will be 1/4 mile on your left. Take Rt 16 North towards Wakefield. At the traffic signal with Rt. 109 in Wakefield, take a left towards Wolfeboro. After 8.7 miles, the CVRTC engine house will be on your right. Take Rt 11 or Rt 28 to the Alton Traffic Circle. Continue through the circle on Rt. 28 north towards Wolfeboro. Entering downtown Wolfeboro keep right onto Rt.28/Rt.109 North. Travel 3.2 miles to the flashing yellow light intersection with Rt. 109 and take a right. The CVRTC engine house will be 1/4 mile on your left. Using GPS in your car?